Isang Yun (1917-1995)! His High Modernist music was increasingly ubiquitous in the sixties on the New Music scene and then somehow the music seemed to vanish in the States. What happened? He was Korean born and spent his formative and then artistically acclaimed years in Germany. His life fell under shadow when he was kidnapped by the South Korean Secret Service and jailed in South Korea, where he was forced to sign a confession that he was an agent of North Korea. From that point on his life was marginalized and in the end un-secure. Though he was released by South Korea in 1969 and after his death the government admitted that his persecution was based on baseless charges, his life was under something of a pall thereafter. Some 24 years after his death there are signs that his music is again receiving the attention it deserves. The two-CD set at hand is a most auspicious and welcome event. 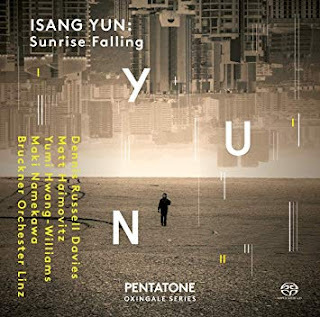 Sunrise Falling (Pentatone Oxingale Series 5186 693) involves some key orchestral works, some important concerted works for cello (Matt Haimovitz) and violin (Yumi Hwang-Williams) interspersed with chamber works, primarily music that further explores cello and violin potentialities. The vast majority were written in his later career in the '70s and '80s and gives us a vivid window onto his fully mature Modern voice. There is a logic to the sequencing that makes total sense. Disk One is oriented toward the cello and so we find the 1976 "Concerto for Violincello and Orchestra," a middle-grounding "Interludium A for solo piano" (1982), then to "Glisses for Solo Cello" (1970) and a rather breathtaking orchestral "Fanfare & Memorial" (1979). Disk Two gives us a violin-centric perspective with "Concerto for Violin and Orchestra No. 1" (1981), a later work notable for its partial, rooted return to tonality while keeping to the original sound-color palette he utilized so well, "Kontraste. Two Pieces for Solo Violin" (1987) and "Gasa for Violin and Piano" (1963). Wow...just...wow! 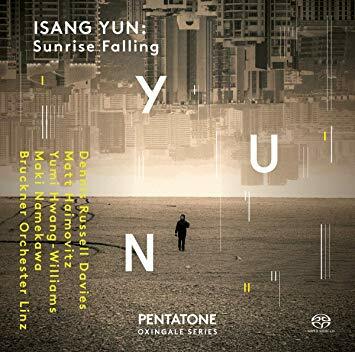 How have I managed not to have heard of Isang Yun until less than a week ago?!! There's really nothing in his idiom that would scare someone who can handle, say, late Messiaen, and for a 1970s work with immediate, shattering impact that Cello Concerto of his is right up there with Lutoslawski's. Thank you, Grego! Hey I am glad you like the music Chris! Thanks. The answer of why I guess is one of politics? You are right, on a musical level there is everything interesting and accomplished, original, very worthwhile going! I remember his music being interesting and then, nothing! Now we can give him his due in retrospect, I hope!